John graduated from Oxford University in the UK with a degree in Theoretical Physics. He also has a MSc in Reactor Physics and a PhD in Magnetic Resonance Physics. He was a researcher and manager at AT&T Bell Labs for 36 years and elected a Bell Labs Fellow in 1991. He had his present home built in Avalon in 1974 and retired there in the year 2000. For many years he has worked with the Wetlands Institute and was honored by them for his contributions to terrapin conservation. He was President of AHLOA for 3 years beginning in 2011. John has been a long-standing leader and contributor to AHLOA. As past President and other roles, his experience and skill have been an invaluable resource. John, his wife Muriel, their children and grandchildren love Avalon and its residents. 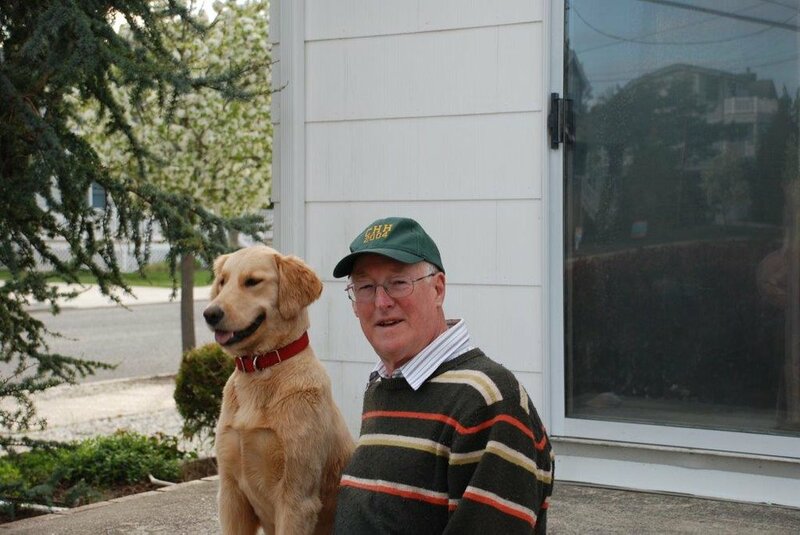 On the lighter side, John’s picture with Kasey (below) demonstrates the adage: “Man’s Best Friend”. Mike graduated with a BS from Mount St Mary’s University, a MS from the Naval War College and a MS from Salve Regina University. From 1968 to 1996 Mike served in the US Navy in several capacities as a Naval Aviator, Squadron Command, Air Wing Command, and Naval Air Station Command to name a few. Thank you, Mike, for your service to our country! Mike and his family have been coming to Avalon since the 60’s. Both of his sisters have homes in Avalon and following the family tradition, he and his wife Carol became permanent residents in 2006. Mike and Carol are the proud parents of three children and 6 grandchildren. In his spare time, he likes to “keep Carol happy”, read, volunteer at the Holy Redeemer Food Pantry and especially enjoys his grandchildren’s activities. Mike has been involved with AHLOA since 1999 serving as Vice-President and then President in 2009-2011 and 2015-2017. Mike has also served on various committees including the School Board and regularly attended Borough Council Meetings. He has quite a commitment to AHLOA and its purposes. He enjoys interacting with the Avalon residents that attend the monthly meetings.